I have always drawn however it wasn’t until the birth of my son in 1996 that I gave up work and began to paint in earnest whilst looking after two small children. I turned professional in 2003 when I participated in the Fourth Edition of the Biennale Internazionale dell’Arte Contemporanea in Florence Italy. Participation in this event was by invitation only and an International Committee chose artists solely on merit. Since then I have exhibited locally, interstate and internationally and interest in my work is growing. 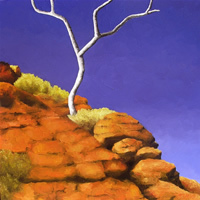 I am represented by galleries in Brisbane, Sydney and the Gold Coast and in private collections in Australia, Spain, China, Germany, Ireland, Canada and the United States. Light on form is my inspiration and fuels all my work. 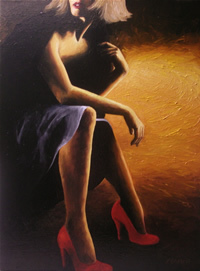 I start each piece as an exercise in lighting form, whether that form is the human figure, or the landscape/seascape, and each piece invariably progresses into a spiritual journey where the painting evolves into a vignette of my everyday life – the emotions, the responses to external events and pressures, and the ongoing spiritual reflection: all rarely articulated. Whilst not intentional the women in my paintings feel and face pain and in my landscapes a deep emotion is evoked. This emotion comes as I paint and subconsciously it dictates the creation of each facet of the painting – the palette, the background, the brushstrokes. Each piece takes me on a journey, sometimes unwelcome but always illuminating.